Small Business School, Inc. - #8 There is a secret universe of the exceedingly small. #8 There is a secret universe of the exceedingly small. From the Big Board-little universe on the left, notice the range from Step 41 to 30. Nobody knows what is in there. The only thing to count is the expansion of vertices and the multiple of the Planck Length. With over a trillion vertices at step 40 (underlined in red), an imposing infrastructure could be created. 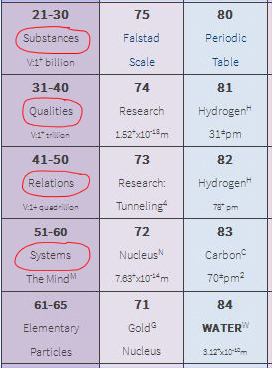 From the Universe Table on the right, the left column (purple background) has five summary blocks from steps 21 to Step 65. We have made some speculations from systems philosophy thinking, "how does the simple become complex?" From the Planck Length to somewhere around notation or step 60, we are making these a domain for "geometric philosophies." Above Step 65, we are all made up of the same types of particles and atoms, yet individuation is absolute. Trees are trees. Bears are bears. Humans are humans. Below Step 65. The structure of things can not be observed or easily measured, but there is number and geometry. There are over a quintillion vertices at step 60. With so many vertices, certainly a diversity of structure and uniqueness becomes possible. At some point in time, the academic community will have a huge discussion about that geometry. Simple logic tells us that it is all somehow shared. But, how it merges into the human scale structures and then into our large-scale structures is a very long-term research project and challenge. Our first principles and basic assumptions are sacrosanct. We assume continuity/order, symmetry/relations and harmony/dynamics cohere from the Planck Length to the Observable Universe. Let's speculate, but in the light of the Large Scale universe. Geometries. With four vertices a tetrahedron might manifest. With six vertices an octahedron, with seven vertices a pentastar, and with eight vertices an octahedral-tetrahedral chain begins with one octahedron and two tetrahedrons. With every two additional vertices that chains grows by either one octahedron or two tetrahedrons. That chain has been dubbed a TOT line and it can perfectly tile the universe with three dimensions. Further tiling the universe. As these structures grow, encapsulation becomes possible. 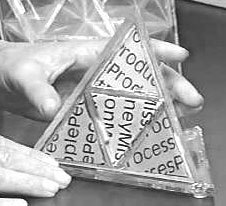 Four tetrahedron and an octahedron enfold within a tetrahedron. Structures build upon structures. 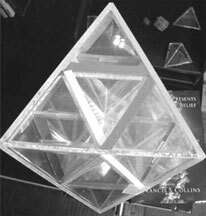 With an octahedron six octahedrons and eight tetrahedrons are enfolded. Around the common center point, there are four hexagonal plates, all sloped in 90 degree angles to each other. Each can readily share edges with other hexagonal plates from abutting tetrahedrons and octahedrons such that the entire universe is tiled with each plate beginning with Step 4 and readily going to Step 206.